Loch Shiel is a large, deep loch that links the steep hills of Glenfinnan to the north with the flat marshes of Acharacle to the south. The Rivers Callop, Finnan, Slatach, Scamodale, Polloch and numerous smaller burns feed the loch and provide important nursery grounds for fish populations. The loch’s only outflow is the 4km long River Shiel, which drains the loch at its south western end. The loch is designated as a Special Area of Conservation due to its black-throated diver population. Commercial forestry is present around the Hurich, Callop and Finnan rivers. Two salmon smolt farms operate, one at the north end of the loch and one near the south. 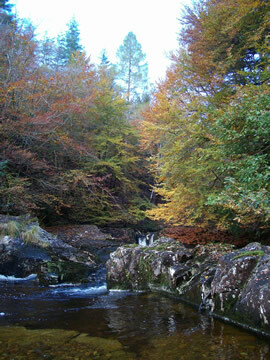 The Shiel catchment was once famed for its sea trout fishery. This declined in the early 1990s and salmon are now the major target species on the River Shiel and the large tributaries. Brown trout fishing has become increasingly popular on the loch and large specimens are regularly caught. Eels, brook and river lamprey, flounder and stickleback are also found in the catchment, though charr are thought to be absent from the loch. Minnow have been introduced into the loch, probably as a result of discarded live bait, and are now widespread in the catchment. 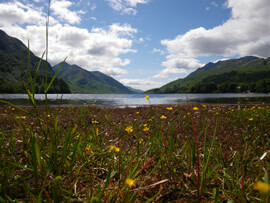 Bank fishing is not permitted on Loch Shiel. Details about fishing on the River and Loch Shiel and how to buy permits can be found at FishLochaber.